Kids should aim for 60 minutes of physical activity each day. 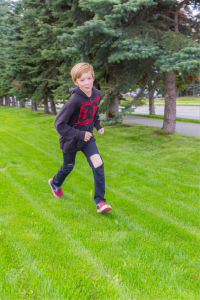 Currently, The State of Alaska is collaborating with local and state programs in creating and implementing various programs in an effort to reduce childhood obesity and its associated health consequences. In 2012, The Department of Health and Social Services launched the Play Every Day campaign to increase community awareness about the health risks of childhood obesity, the importance of physical activity, and choosing healthy drinks to prevent and reduce obesity in Alaska. DHSS also partnered with Healthy Futures, a local signature program of the Alaska Sports Hall of Fame which works to promote physical activity in children and adolescents from more than 200 schools. Physical activity has many positive benefits for children, including impacting them academically, behaviorally, and physically. Current recommendations from the Centers of Disease Control are for children to aim for 60 minutes of physical activity per day. Healthy Futures created a challenge to incentivize and reward children who record their monthly minutes spent doing various physical activities. This challenge was introduced in promotional video clips aired on local television networks to increase awareness of the program and enlist more participation from kids statewide. At the individual level, families can take personal steps to include small changes in helping their children grow at a healthy weight by focusing on both increased activity and improving nutrition in the home. Encourage kids to participate in sports at school or venture outside to play with siblings and friends, or involve the whole family by heading to the park, biking, or going for a short hike. Increased physical activity allows young and growing bodies to use extra energy in a healthy way and establish active habits at an early age. Similarly, nutrition is a cornerstone in promoting healthy growth and development during childhood. There are many ways to begin eating better as a family. Some ideas to consider may be to cut back on packaged or quick foods and limit sugary beverages like soda, Kool-aid, Tang, and other flavored juices. Other nutrition-focused improvements could be to include kids in meal prep, increase vegetable servings, and make more homemade meals. Why not start something new today?